The future tense is a type of grammatical tense. It is a verb form that is used to represent something that hasn’t happened yet, but will. I am eating. I will eat later. ‘I am eating’ indicates that the action is happening right now, at this very instance; however, ‘I will eat later’ indicates that the person is not eating right now, but will eat at a later time. I will send you the information tomorrow. Martha has to go the store tomorrow. John will be busy them. Are you going to make dinner? I shall write the letter next week. The future tense can be use in a variety of ways, such as to make predictions or statements of fact, to talk about intentions, to discuss arrangements and scheduled events. There are four different types of future tense in the English language. They are simple future tense, future progressive tense, future perfect tense and future perfect progressive. The examples above mainly belong to the simple future tense. 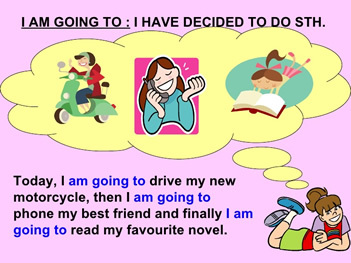 Let us understand the different types of future tense, via an example. Simple future tense: Used for an action that will occur in the future. I will arrive at 5 o’clock. Future progressive tense: Used for an on-going action that will occur in the future. My mom will be staying for five days. Future perfect tense: Used to describe an action that will have been completed at some point in the future. Will you have finished all your work, in time for the party? Future perfect progressive: Used for an on-going action that will be completed at some specified time in the future. Next month, we will have been married for 25 years.